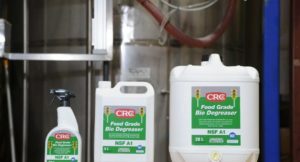 CRC Industries has introduced a new NSF A1-rated CRC Food Grade Bio Degreaser which expands its leading CRC Greenlight Food Safe Program range. The degreaser is an extra heavy-duty cleaner formulated to penetrate and dissolve tough grease, oil and contaminants for easy removal – safely. CRC Industries Australia Managing Director, Shona Fitzgerald, said the product had been scientifically formulated for use in food processing applications. The product can be used confidently on all metals and alloys and will not damage bright metals including aluminium and brass. It is safe for use on fibreglass, glass, plastics, rubber, painted surfaces and laminates. It is also gentle on the environment with all ingredients readily decomposable. “This product has been specially formulated to penetrate and dissolve tough grease, oil and contaminants for easy removal – with a focus on personal and environmental safety,” Mrs Fitzgerald said. “These properties make it ideal for use in many applications especially where there are regulations or restrictions in place concerning the types of products that can be safely used or allowed. CRC Food Grade Bio Degreaser is available in 5L and 20L bulk containers as well as a 750mL trigger pack. “The launch our new CRC Food Grade Bio Degreaser is an important milestone for CRC as we remain focussed on adding customer value through extensive research and development, anticipating demand and delivering the right solutions in an ever-changing market, whilst adhering to the strictest protocols for food safety,’’ Mrs Fitzgerald said.